Three of the four directors of Paramount Conversions. LtoR: Willie Daniel, Paula Nooney and Aidan Farrell. 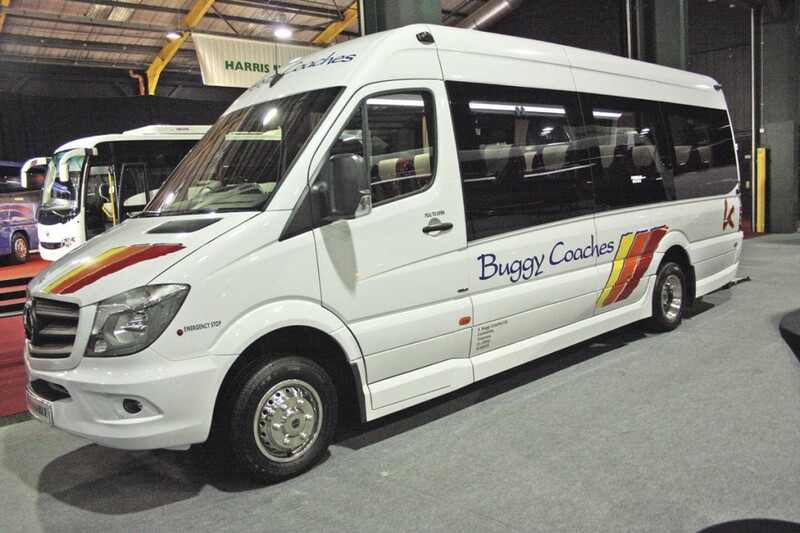 In 2010 following the Coach and Bus Show in Dublin I made my way to County Offaly to Tullamore to visit a then new vehicle convertor producing quality minibuses and coaches called Paramount Conversions. I’ve now returned to see the progress the company has made in recent years to become one of Ireland’s major vehicle convertors. Paramount Conversions was set up by William ‘Willie’ Daniels and Aidan Farrell. Before setting up Paramount Conversions both men had honed their skills at KVC, based a few miles up the road at Kilbeggan in County Westmeath. Willie’s skills lay in sales and the customer interface whilst Aidan’s lay in the actual conversion process. Willie’s knowledge of the market in the Republic and Northern Ireland for minibuses and coaches is second to none. Aidan is a qualified mechanical engineer and he has enviable knowledge and skills in how to convert vehicles. Their philosophy, right from the start, was to set high standards both in the terms of the quality of the vehicles they build but also in the way the company conducts its business. They have consistently built on that to achieve the high reputation they now have for quality. It took immense courage on the part of the two young men backed wholeheartedly by their wives, Michelle and Paula, to set up on their own. Through sheer hard graft they got the business off the ground. They were lucky in being able to recruit a couple of other skilled bodybuilders but Aidan admits it was hard at first. He naturally had to immerse himself personally heavily in the conversion work and that involved working long hours. That hard work has paid off as they now have a thriving business which has gone from strength to strength and have built a massive reputation for the quality and innovation of their vehicles. Whilst Paramount Conversions are primarily known for their minibuses and coaches they will tackle almost any type of conversion. 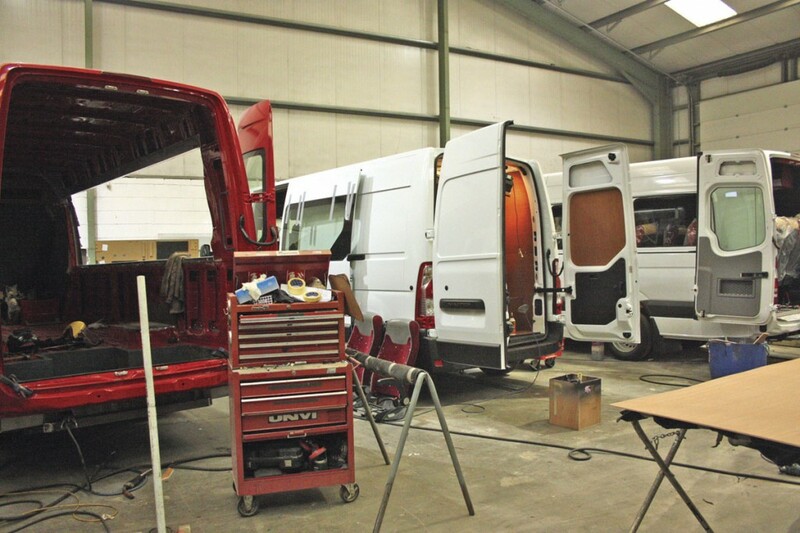 Another area where they have a big reputation in Ireland is work on commercial vans spanning from simple lining out of vans, through the fitting of safety bulkheads between passenger and load spaces to the complete fitting out of vehicles. 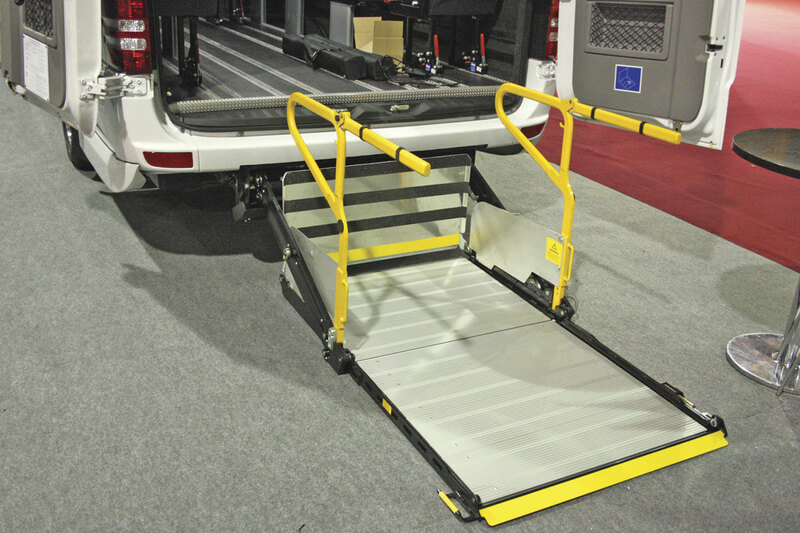 They also excel in producing Mobility vehicles for the disabled. This an area that Aidan takes very seriously and he personally carries out the majority of the conversions himself. So you can see that the company has a broad based set-up all helping to build its reputation as a premier converter. When I first visited back in 2010 the company occupied a single unit on a small industrial estate on the outskirts of Tullamore and at that time that was more than adequate for their needs. Roll forward to 2015 and that is no longer the case. In the intervening period they have doubled the production and recently, to increase that even more, they have moved the office and administration functions out of the main unit into a separate self-contained unit in the yard. They now have 10,000 sq ft devoted to production. Even that is not enough and the team is urgently looking for larger premises with a large yard area which is something they seriously lack at the present premises. Growth in the business has also seen growth in the workforce, which now stands at 12. The team has changed too. Willie still manages the sales operation which has naturally grown as the business has expanded. Aidan is in charge of the production side of the business which has equally grown. But the growth of these meant they needed help with the actual running of the business. Therefore Administration and Marketing is now the responsibility of Aidan’s wife Paula. With her background knowledge from having worked in the industry as well as in retail and customer service Paula has become a integral part of the business. We mustn’t forget Willie’s wife Michelle either, because as she has done right from the start she takes care of the accounts side of the business. 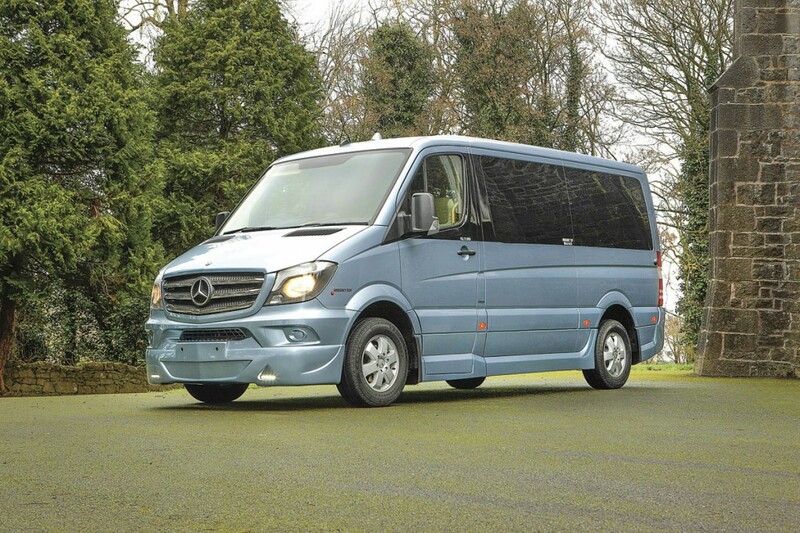 Whilst a large percentage of their work involves converting the ubiquitous Mercedes-Benz Sprinter range they also convert a wide range of vehicle types particularly on the commercial and Mobility sides. These include vans from VW, Fiat, Iveco, Renault, Peugeot, Citroen, Opel (Vauxhall), Nissan and Ford. 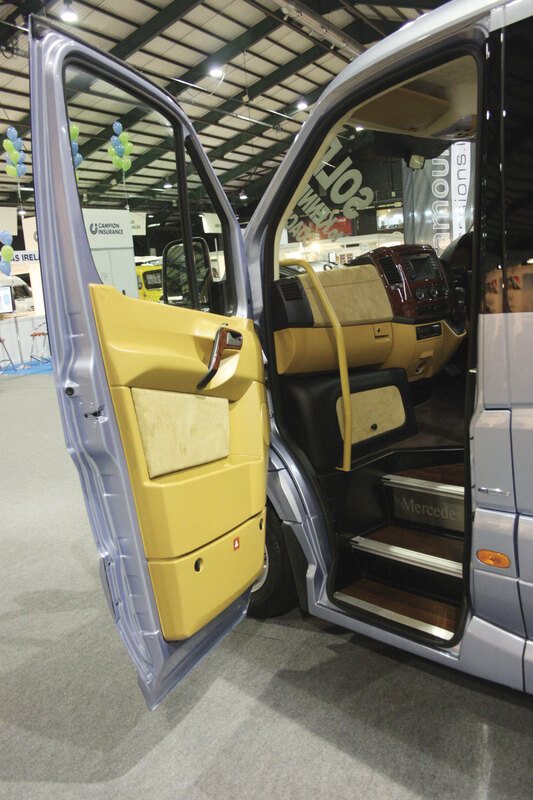 At the recent Coach and Bus Show in Dublin, Paramount Conversions mounted a very impressive display of their conversion capabilities. 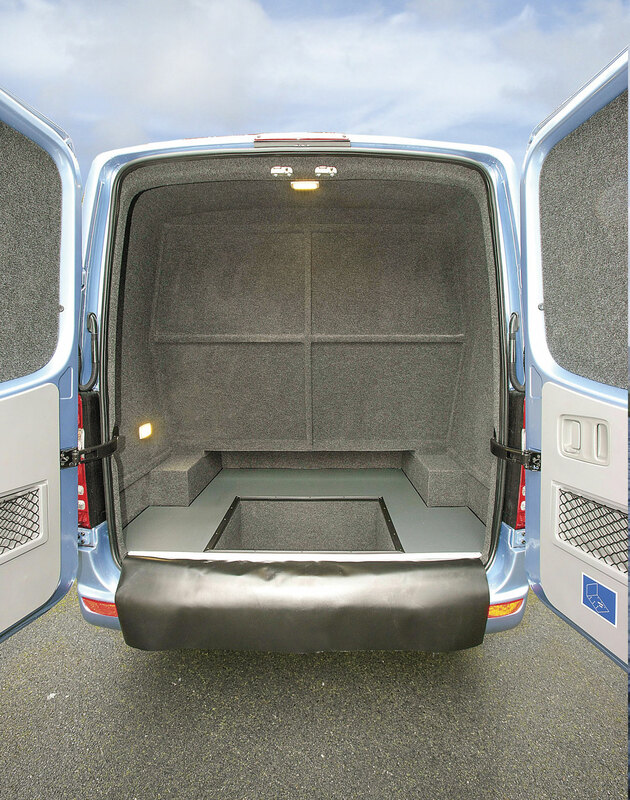 The first of these was a Mercedes-Benz Sprinter 516 manual with front entrance via a well planned, comfortable entry arrangement. 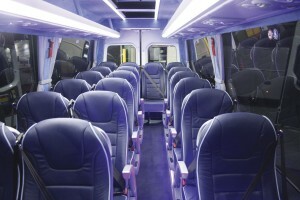 The vehicle was trimmed out to a very high standard, including full length racks incorporating illumination and individual passenger controls. Windows were large panoramic units, tinted and double glazed. It had seating for 16 passengers with some of the seats set at tables. At the rear it incorporated a large drop well boot. The exterior was enhanced by the fitting of well moulded styling skirts. Paramount built the minicoach for Connemara Coaches in the South West of Ireland. The next vehicle I inspected was again a Mercedes-Benz Sprinter 516, this time a fully automatic version destined for Bushers of Wexford. This version featured Paramount’s side entrance layout with plug door. They achieve a good full height entrance with no need for most people to duck on entering the vehicle. Inside the vehicle was subtly trimmed using real leather materials. Again, full length racks were fitted and the vehicle also had a full length glazed roof making it very light and airey for the 19 passengers it could carry. The exterior again benefitted from a full lower body styling kit and was finally set off by being fitted with alloy wheels and finishers. The third vehicle I inspected was very different and highlighted the breadth of Paramount’s conversion skills. Again it was a Mercedes-Benz Sprinter 516, this time a manual. 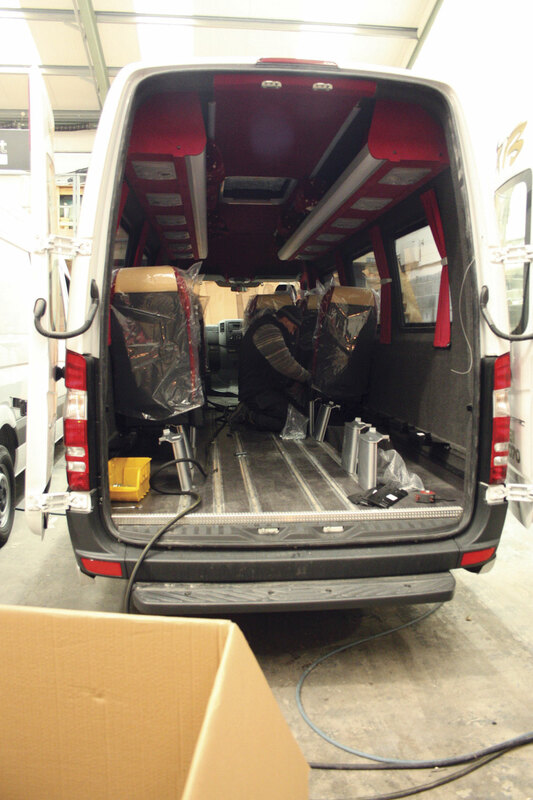 The vehicle had an entry at the front and the flat floor was fully tracked with the 19 seats mounted on quick release fixings. At the rear it was equipped with a Palfinger-Ratcliff underfloor, cassette type, tail lift. It was destined for one of Paramount’s home town operators K.Buggy Coaches of Tullamore, County Offaly. Next I inspected another accessible Mercedes-Benz Sprinter 516 manual converted by Paramount. This one featured seating for 20, again on a fully tracked floor and had the forward entry arrangement. Like the K Buggy Coaches vehicle this too was fitted with a Palfinger-Ratcliff wheelchair lift at the rear and had been built for Foxhound Travel of Rockcorry, County Monaghan. 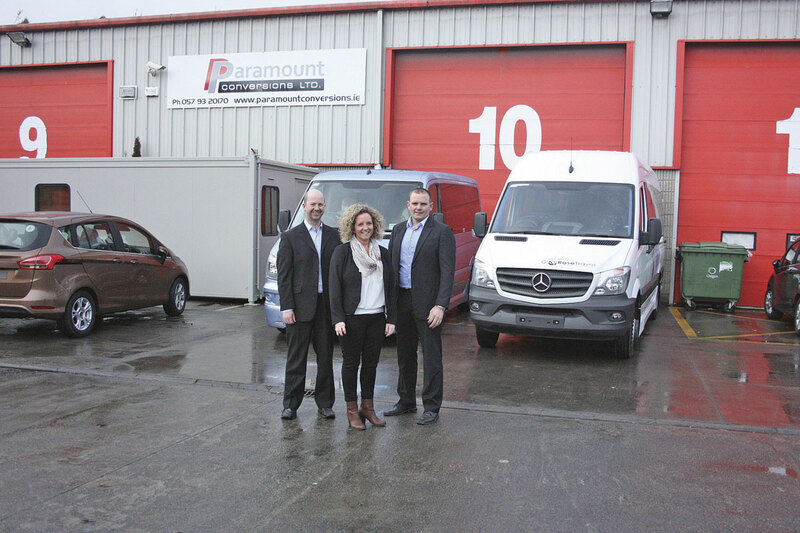 Paramount recently delivered their first Mercedes-Benz Sprinter 516 seated at 22. This again features a forward entrance but this time fitted with a plug door. The first vehicle was built for a UK based customer and more are now in production. 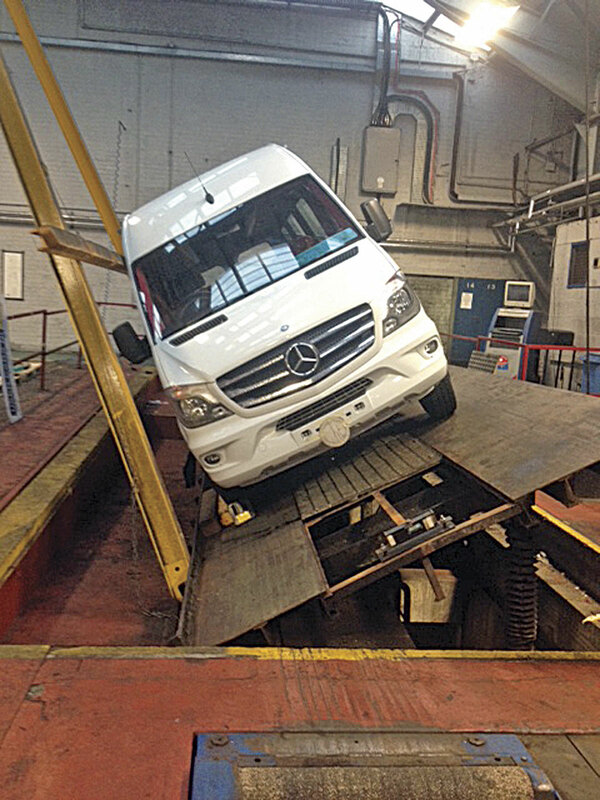 Paramount are very proud of their ability to produce really luxurious vehicles and this was exemplified by another Mercedes-Benz Sprinter, a 316 automatic that I inspected. Called the VIP it again had the forward entry but inside it was really sumptuously trimmed using luxurious soft feel materials including suede effect. It also had a wood effect floor and a glazed roof. 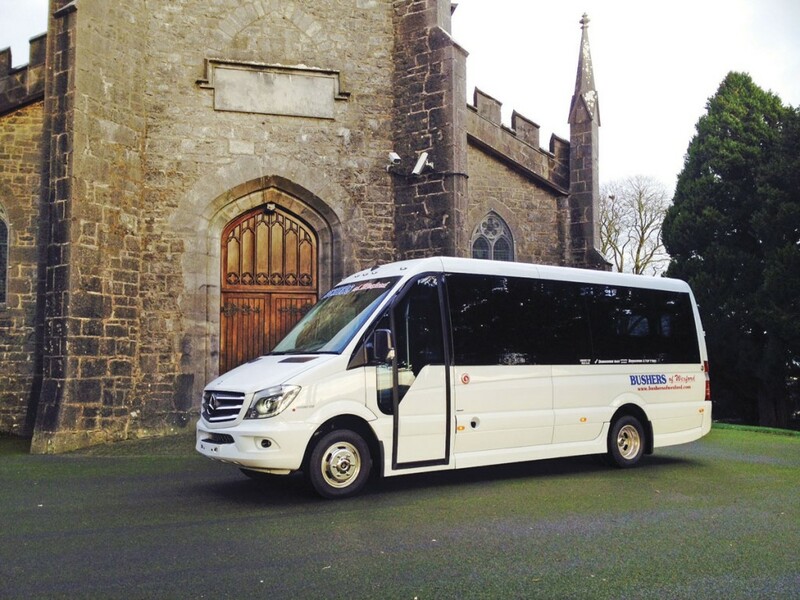 It had seating for just nine passengers in very real leather seats and was built for Kennedy’s Coaches of Annascaul in County Kerry. When I visited Paramount there was a whole raft of vehicles in various stages of production emphasising their breadth of coverage. 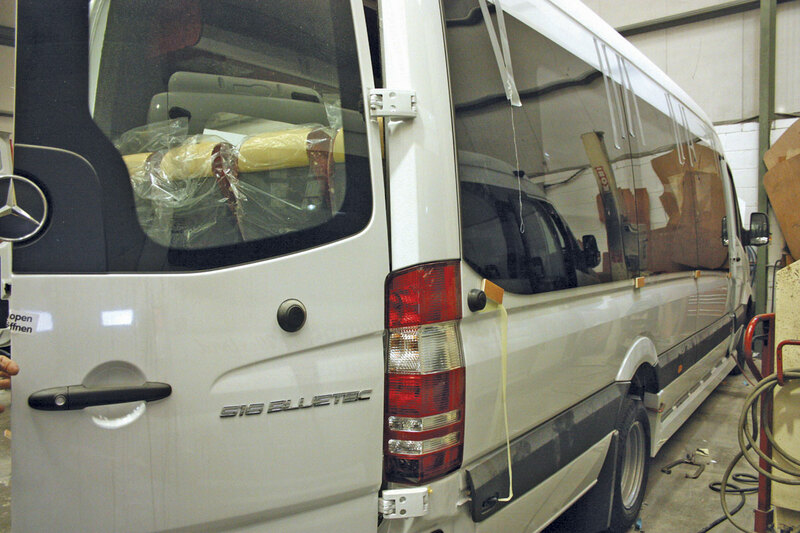 These included five Mercedes-Benz Sprinters being converted, two were being built as accessible vehicles and the other three as minicoaches with varying degrees of luxury. There were also a couple of vans being converted for commercial use and a car having mobility equipment fitted. If I give the impression that Paramount Conversions only produce vehicles for operators in Ireland, let me correct that impression. They have built a considerable number of vehicles for customers in Northern Ireland and also mainland UK. They have established aftersales facilities available in the UK. It was good to catch up with the Paramount gang again and to see the amazing progress that they have made in a short time. 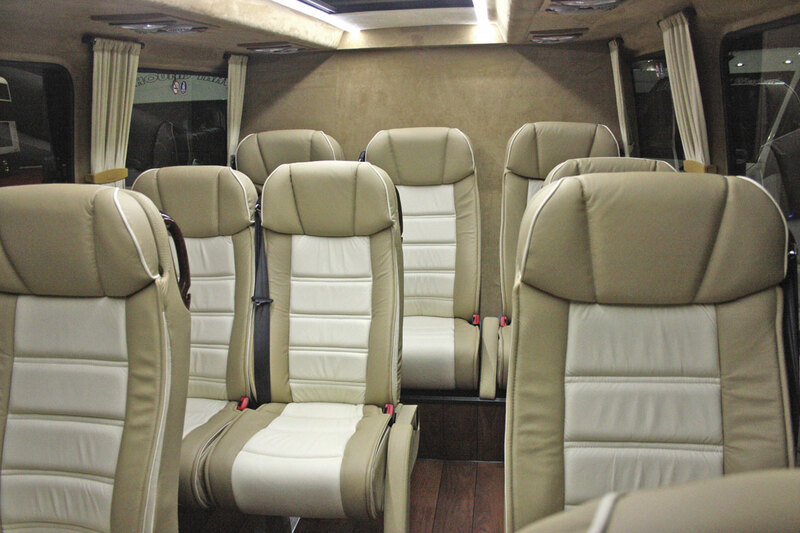 They have become established as one of the very best producers of minibus and coach conversions with a well earned reputation for producing quality vehicles built with care and attention together with flair and innovation. I have no doubt they will continue to build on that hard earned basis and look forward to seeing how they progress.